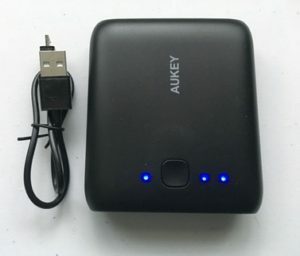 Although power banks with a larger capacity such as Aukey 20000mAh power bank will last you much longer, it’s also a lot bigger and bulkier than the Aukey 10000mAh power bank. The truth is, a capacity of 10000mAh is enough for most people, therefore, there’s no need to carry around a bulky power bank. Of course, for those people who need a portable charger for multiple devices or overnight trips a larger capacity portable charger may be required. 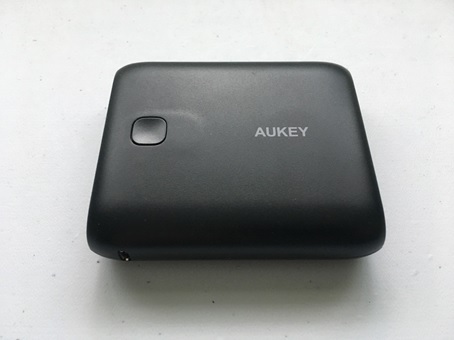 However, a larger portable charger won’t feel comfortable in your pocket so you’ll probably need a bag for it, whereas this Aukey 10000mAh power bank fits perfectly in your pocket! Handy 10000mAh capacity which is enough to charge an iPhone 7 three times. Dual USB ports with an output of 2.1A and 1A, can charge two devices simultaneously. AiPower technology ensures your devices will gain the safest maximum recharge rate. Built-in handy flashlight perfect for finding small items in your bag. Protected against excessive current, overheating and overcharging. LED indicators will tell you how much power is remaining. Covered by a 24 month warranty by Aukey. Compact enough to fit into your pocket and quite light too, so it won’t be that noticeable in your pocket. Capacity size should be sufficient enough to last the whole day, providing you’re only using it to charge no more than two devices. The built-in flashlight can be very useful in certain situations. One of the ports has quite a slow output rate which means your device will charge very slowly. A full charge may not be sufficient enough for longer trips away where an overnight stay or longer is required. No carry pouch included, so if you’re putting it inside a backpack or suitcase, you can easily lose the charging cable since it’s not together with the power bank in a pouch. Looking for a very affordable compact portable charger that’ll easily last you the whole day? Look no further, the Aukey 10000mAh power bank will get you through the day ensuring your smartphone will always have enough power. Unlike other power banks with a larger capacity such as the iMuto Taurus X4, this Aukey model is not too big or bulky and will easily fit inside your pocket. Users who will need to often charge two devices simultaneously will have to sacrifice fast charging speeds for one of their devices as one of the ports only has an output of 1A. 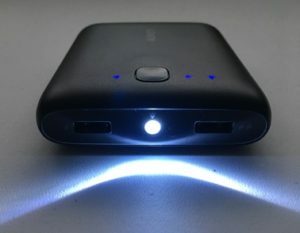 The device connected to the other port will benefit from much faster charging speeds as that port has an output of 2.1A. However, this may still seem slow for owners of the Aukey 20000mAh power bank as it has dual USB output of 2.4A.